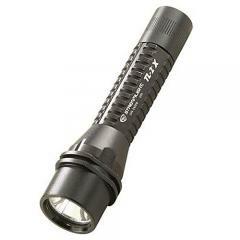 Take advantage of the latest improvements in technology with a TL-2 XL LED with Strobe Flashlight from Streamlight. The TL-2 XL features C4® LED with a lifetime of 50,000 hours. The lens is crafted with high temperature glass and gasket sealed, and the light itself resists water, impact, and rolling away if dropped. This flashlight includes a parabolic reflector for a beam that illuminates evenly and maximizes your peripheral view. Streamlight's TL-2 XL LED operates via a one-handed push button tail switch in both momentary and steady modes, and offers three intensity options of high, low, or strobe. Carry your serialized light via a pocket clip or wrist lanyard, or mount it onto the rails of your weapon.